I love the Portes du Soleil ski area and I think it’s one of the best in France if not the World! 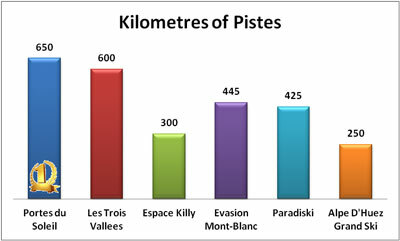 So I’ve put together a few statistics to show how the largest ski domains in France compare. The Portes du Soleil clearly comes out on top with the 650 kms of pistes throughout the whole domain. There has been some controversy recently over how the resorts come up with these figures, with German ski author and cartographer Christoph Schrahe claiming pretty much every area exaggerates their numbers. It is funny how every resort seems to add up to a pretty round number ! The Portes du Soleil should get busy revising their figures to include the brand new piste built for the new Super-Chatel to Linga link. 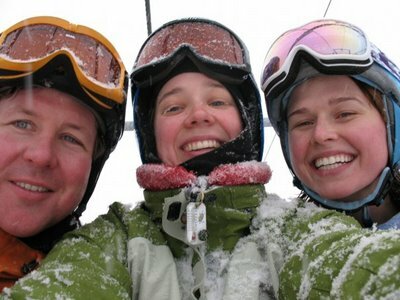 A large chunk of the cost a ski holiday is the cost of your lift pass for the week. 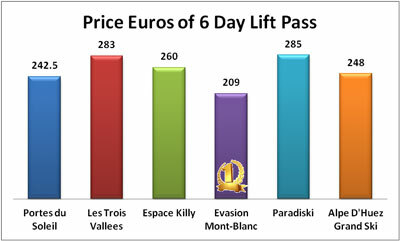 This graph shows the cost of a 6 day adult lift pass covering the whole area. Portes du Soleil comes in second best in this category. Remember to book your ski holiday with Absolute Alps and receive an extra 10% discount on the cost of the your ski passes. 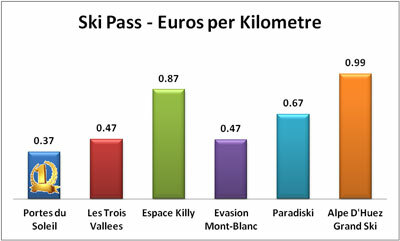 But what you really want to know is that you are getting value for money with your ski pass. So yet again we have the Portes du Soleil coming in first place with its fantastic value for money ski pass which costs €0.37 per kilometre of piste. Which is significantly cheaper than everyone else, with the next closest 27% more expensive and then soaring up to 167% more for the most expensive area located at Alpe D’Huez. Variety is supposedly the spice of life and we want lots of different pistes to choose from when we go skiing. 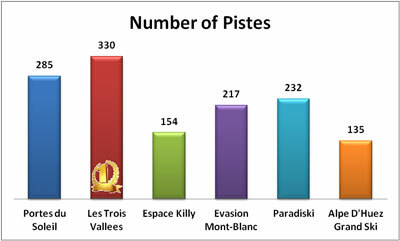 Storming to the top spot with the only area to break the 300 mark is Les Trois Vallees. 330 is a lot, if you skied 6 hours a day for 6 days you would need to average over 9 runs an hour to tick them all off! I think you would need more than 1 holiday to tick them all off. But a very respectable second place goes to the Portes du Soleil, and as mentioned earlier we should be adding an extra one for the new lifts and piste currently being finished in Chatel. 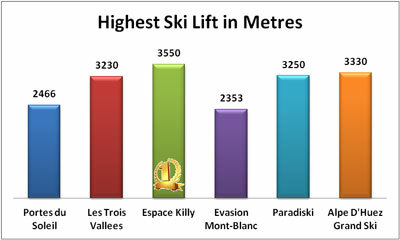 Any list of skiing statistics wouldn’t be complete without a mention of height of the ski area. A good win for Espace Killy here, which towers in at 3550 metres. But we all know that size isn’t everything, don’t we ? Go too high and it’ll be too cold in the winter, too white on cloudy days with no trees to help navigate. So although Portes du Soleil looks a little low on the graph with average snowfall of 8 metres and plenty of tree lined runs for the white out days I think it’s a perfect height! Conclusion – Portes du Soleil is the BEST ! Well I think my carefully selected statistics, were Portes du Soleil comes top twice & second twice, clearly show that my home ski domain is the best in France. But really I think you should come and see for yourself, and while skiing in one of the best ski domains why not stay in one of the best chalets in France – Chalet Les Trois Canards. There’s been plenty of new development and replacement work to the ski lifts in the Portes du Soleil again this summer, here’s a run down of the shiny new ski-lift facilities you’ll be able to find for winter 2015. Firstly here’s a link to the newly issued Portes du Soleil piste map for 2015, which has been updated to show the new lifts and pistes for the coming season. Check out the pink “NEW” stars showing the recent upgrades! Starting with the local ski area. As mentioned in my earlier post the long talked about and anticipated link between the Chatel’s two ski areas is finally being built. Both lifts will be the high speed detachable type, the initial plan was for one of the lifts to be a refurbished older style slow lift but there will now be a brand new 6 person detachable up to Super-Chatel called “Portes du Soleil” and a refurbished 4 person detachable going to Linga called “Gabelou”. The blue piste from Linga to Gabelou has been totally reshaped from the old windy track into a broad and fairly straight piste, making it easy for beginners to return to Chatel. The project is reportedly currently running a little behind schedule and is reported looking at a January opening. There has been an official announcement saying it will definitely be open this winter but the opening date has not been confirmed yet. So we are past the half way mark now and well into the February school holidays, and it’s all good here in the snowy and cold ski resort of Chatel. This season has produced great conditions pretty much every week, and for a period at the start of February I’d say conditions were as good as they ever get. We started on high at the beginning of December with deep powder covering the mountain and resort, our first lucky clients staying the week before Christmas had a great time on very quiet and very snowy pistes. A little bit of rain just before Christmas did flatten down the waist deep powder a little but the festival spirit was definitely not dampened down. It was a very busy Christmas and New Year in the resort with the holidays falling mid week again after a couple of slightly quieter year when they fell on the weekend, but with the great snow cover and massive expanse of the Portes du Soleil to discover lift queues are never too bad here. Ski helmets and the debate about whether to wear one or not, is a topic that is constantly coming up in news. I would definitely say that more and more people are wearing them each year on the slopes, a recent survey said that up to 77 percent of British skiers now claim to wear a ski helmet and that’s up from 62 percent just a couple of years ago in 2010. 77 percent is pretty impressive figure and I would be very interested to know how that figure breaks down by age group. 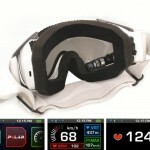 Parents usually insist on children wearing them and it’s an essential cool piece of kit for most snowboarders too. This year a major ski insurer, Essential Travel, has become the first in the UK company is insist that all ski insurance policy holders must wear a helmet on the slopes. This created quite a fuss in newspapers and on-line, but was it just a publicity stunt ? or just sound advise ? So what are the arguments for and against ? Many people are now saving money on their ski hire by booking in advance on-line. But that means having to make the choice about which skis you’ll be wanting whilst sitting at home in front of your PC. Traditionally that decision would be made in the ski shop with a little help from the staff who worked there and who would hopefully be able to offer you advise on the best skis for your ability and preferred terrain. Of course not all ski staff are helpful and everyone should have a some basic knowledge of different ski types and how to choose a ski suited to their individual style. Most stores will offer 3 or 4 different categories of ski, so which should you choose ? 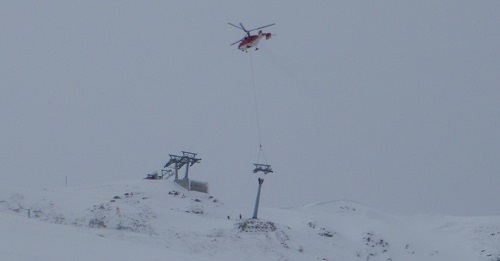 This year we have 3 new ski lifts currently being installed throughout the Portes du Soleil, for the coming 2012/2013 ski season. 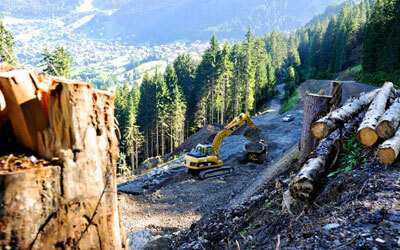 Morzine is replacing the old and slow Troncs chairlift with a new high-speed six seater chair. This lift starts at a collection of restaurants and runs up to the Nyon area which has a snowpark and several great runs, including the fantastic red from the top of Pointe de Nyon. I regularly stop for lunch at the nearest restaurant to the bottom of this chair, so I’m looking forward to speeding off up hill straight after lunch next season. The Morgins lift company is installing a new high speed lift to replace Les Bochasses, which was a very old T-bar drag lift. This lift is in the area between Morgins and Champoussin, it too has several great pistes that always used to be very under used and quiet because of the cranky old lift. But with a new lift in this area I reckon there will definitely be more skiers on the pistes next season. Avoriaz is busy replacing the big old cable car that runs from the bottom of Prodains up to the resort, the old cable car only had a capacity of 400 people an hour. But the new 3S cable car system will have a capacity between 2000 and 2400 people an hour. The 3S system is the latest ski lift technology, which combines the benefits of large cable car with the constantly moving chair lift system. Avoriaz will have 12 cars with 35 seats in each, the cars rest on 2 cables with provides a more stable ride. The lift station at the top is also being completely rebuilt to provide improved entry and exit. Although we are going to have to wait until mid-February 2013 to try out this new lift, but I’m sure it will be worth the wait. Whenever I went to use the old lift it invariably departed just as I got there and so the whole trip would take well over half an hour. I’ve been skiing the Portes du Soleil for over 10 years now and thought I should share a few of my favourite mountain side restaurants. What is better than a little local knowledge when looking for somewhere to stop for lunch. This restaurant is often a favourite with guests staying at our ski chalet, it’s easy to find and a great rendezvous place for a big group, loads of seating outside for sunny days and a wood burning stove inside for chilly days. Great value food with cheese burger and chips (Surfer et frites) for under €10. It can be a little slow to serve food during busy weeks of the season so a good idea to avoid the 12:30 – 13:30 rush hour. Thought I’d better get this list in early as these are amazing gadgets but they’re not cheap. So you’ll need a little time to save up and convince yourself you can’t possibly hit the slopes next winter without these must have items. Embedded with a GPS, Accelerometer & Gyro – you see stats such as speed, vertical descent, jump airtime, navigation, temperature as you cruise down the mountain. Bluetooth connectivity to pair with your smartphone allows you to see text messages as they arrive, or caller ID as anyone phones you, also control your music playlist. All controlled without having to take your gloves off or your phone out of your pocket. 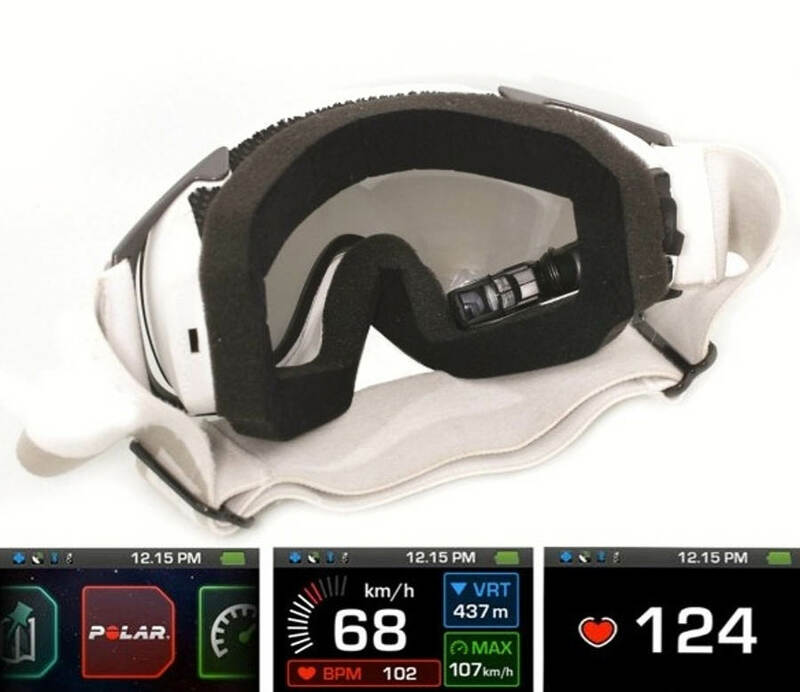 You’d definitely feel like the Terminator on skis with this bit of kit.